Last week was a long and difficult week. I kept meaning to post something, but was unable to keep my thoughts straight long enough to focus on a topic. I am at the end of my three-day weekend and I am still not ready to head back. I am hoping that I will be able to make some posts this week as I have a plethora of ideas floating through my head. I would like to start the week off with my trip to the Sherwood Forest Faire. This is only the second season for this Festival and still has a small renfest feeling. I was lucky enough to win a belt from the good people at Armory Art which made the day all the more enjoyable. If you have never been out to a renaissance festival, I highly encourage everyone to visit. The show I enjoyed most was Paolo Garbonzo, Jester of Muncaster Castle. Paolo does a fire/knife juggling comedy act with some crowd participation. My wife decided to participate and hurl (ok, she tossed) one of the flaming torches at Paolo (my wife is in green). 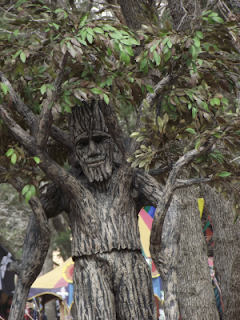 I have to say that the person/creature of the day goes to the ent. This costume must be a pain to put on, but this lumbering tree was most gracious (and complimentary) in regards to taking pictures. Their was an inquisitive fairy that made me laugh as she stole a child's wagon when he wasn't looking and then was confounded when she couldn't figure out how he made it go. I also liked the minotaur just because I like minotaurs, but I think he should have been hanging out by the maze (maybe it's just me). The wind was up and there was a lot of dust being blown around, but all and all it was a good time. 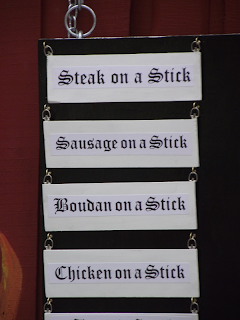 My final thought is from Ben Stiller in Something About Mary; for all those people who think there isn't enough meat on sticks, head down to a renfest sometime.